Let them flow in ceaseless praise. Amen. Life is indeed full of surprises. When we look back at the twists and turns of the preceding years and decades, we see that much has happened as we planned and much has happened in deviation from our plans. Sometimes we saw the promotion or the cross-country move or the death of a parent coming. Other times the proposal or the illness or the market change came out of nowhere and caught us off guard. There is no way we can tell for certain what the future holds, whatever we think we know about the present; Jesus, the son of Joseph, whose father and mother we know, may also turn out to be the bread that came down from heaven. The whole story, full of nuance and intrigue and complication, is still unwritten, hidden from sight, out of view. We only see fragments: our capacity to comprehend the possible is limited; we don’t have the ability to figure everything out on our own. No one can truly know God’s purposes except God’s own self. In today’s first reading, Elijah was too overwhelmed with desperation to recognize the limitations of his own perspective. Elijah found himself in the wilderness because he was running away from King Ahab, who was seeking to kill Elijah after Elijah threatened his power. Elijah could not see any way out of his predicament; he believed he was doomed to be as irrelevant as his ancestors; he thought he should just as well die now and get it over with. But God did not listen to Elijah’s request, and, after a brief rest and some food and drink provided by an angel, Elijah lived to see another day. He went on to speak with God on the same holy mountain where Moses met God and to become one of the greatest and best-known prophets in the Judeo-Christian tradition. What a shame would it have been if Elijah had died when he wanted to! The miracle of Elijah’s story is that there was indeed a future where Elijah saw none. About a decade ago, within the span of about two years, the poet and scholar Jennifer Michael Hecht lost two of her friends from graduate school to suicide. She was shocked and disheartened. To cope, she read about the history of suicide and the arguments against it. She was trying to understand why someone would want to kill themselves and to find out if there was anything anyone could say in order to prevent them from doing so. She decided to collect her thoughts into an essay that she addressed to anyone who might be thinking about suicide. Her message was simple: stay. Life can be really, really difficult, she told her readers, but ending it all hurts the people who love you and also deprives the person you could be of a chance. Hecht aimed not to condemn those who had already lost their lives to suicide, but to prevent those who were thinking about suicide from losing their lives as well. Hecht later expanded her essay into a book, which examines the history of suicide and argues vociferously against it. In it, she wrote this: “Everyone changes, but at a given moment, we tend to feel that this is the way we always have been. With depression, that despair of the possibility of change is even more intense; the depressed person is convinced that she will never come out of it. But even that person has had periods of happiness. It is the nature of existence that this happiness will return—if we stay around to enjoy it…As the talk show host Phil Donahue put it, ‘Suicide is a permanent solution to a temporary problem.’ [His comment] is a pithy reminder that if you live you will have to continue to face this difficult life, but that the particular element that you despise in your life today may be utterly gone tomorrow, or soon after. Of course, depression is more durable than any given setback, but even depression is not permanent. One characteristic of major depression is that it feels as if it will never end, but in fact, even untreated it waxes and wanes, and with treatment most people will experience considerable improvement. There is always hope for a better life in the future, a life that may be sufficiently rich and strange, creative and beautiful, peaceful and vibrant to have made the wait worthwhile.” Elijah was wrong when he thought there was no future for himself—when he thought he might as well die—and so are we when we think the same. We never can tell, can we? When life seems to be going well, despair can hit us suddenly, out of nowhere, changing our whole outlook, upending our entire world, yet when we think we have hit rock bottom, an angel might arrive to comfort us and prepare us to keep going. Our God is a God of resurrection, who hates death so much that he defeats it, who always offers us a new future. So don’t for a second think that there’s no hope. However difficult things have been for however long they’ve been difficult for, make the decision to give it all another shot. Make the decision to stick around and see what tomorrow will bring. Make the decision to stay. 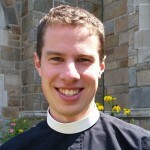 1 As related in Mariann Budde’s “Priesthood: You Never Can Tell,” https://www.edow.org/about/bishop-mariann/writings/2017/06/22/sermon-ordination-priests.